A piece of my mind. : Save Money Drink Beer!! James Beer have come up with a great way of saving money...for beer!!! 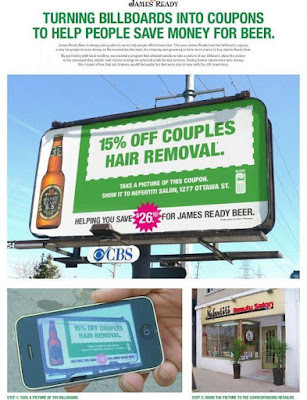 With the creative support of Leo Burnett, James Ready invented billboard coupons, a way for people to save money on like necessities like food, dry cleaning and grooming to have more money to buy James Ready Beer!!! A program has been designed where people can take a picture of their billboard, show the picture to the corresponding retailer and receive savings on selected products and services.